Commissioned as a build for a good friend, this sturdy touring rig was tailored into a lightweight commuting behemoth. Although, careful consideration and numerous details needed addressing before this one could be buttoned up. Originally equipped with tried-and-true Dia-Compe #962 cantilever brakes, those had long been replaced by mismatched Dia-Compe X1 V-brakes by the time I had received it. This was not the look I was going for so a tasteful, atheistically pleasing upgrade would be necessary. I started with Tektro CR-720 cantilever brakes but soon ran into a considerable issue. Although I enjoyed the look of the Tektro’s on the Cresta, the cantilever posts on the fork blade were a scant 60mm wide. 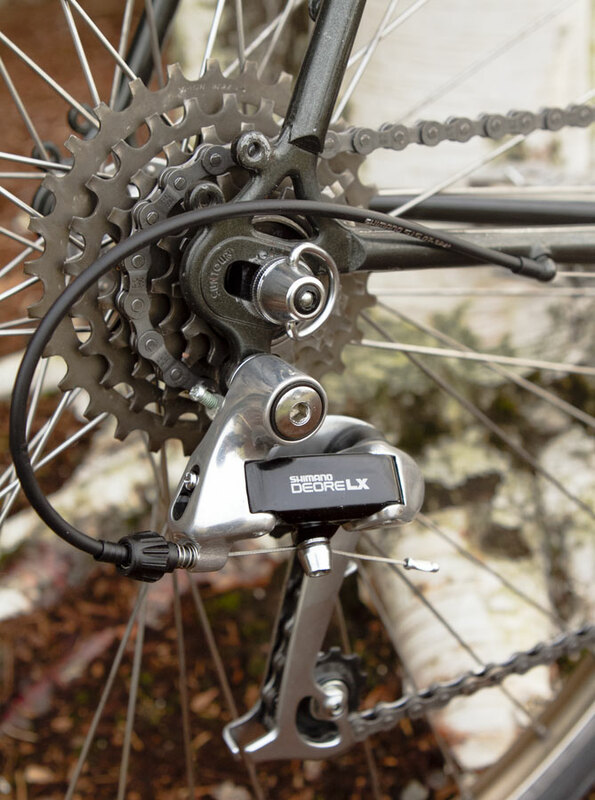 Almost all cantilever brakes, including the CR-720’s, are designed for wider post centers in the 75 to 80mm range. Sadly, this resulted in front bosses that would strike the rim no matter how wide I set them or how thin of brake pads and washers I used. In the end, I discovered a product that solved the problem. Although the price was more than I would like to admit in terms of time spent researching this fix, the Planet X Frogs Bollox cantilever brakes seemed to have what I was after. 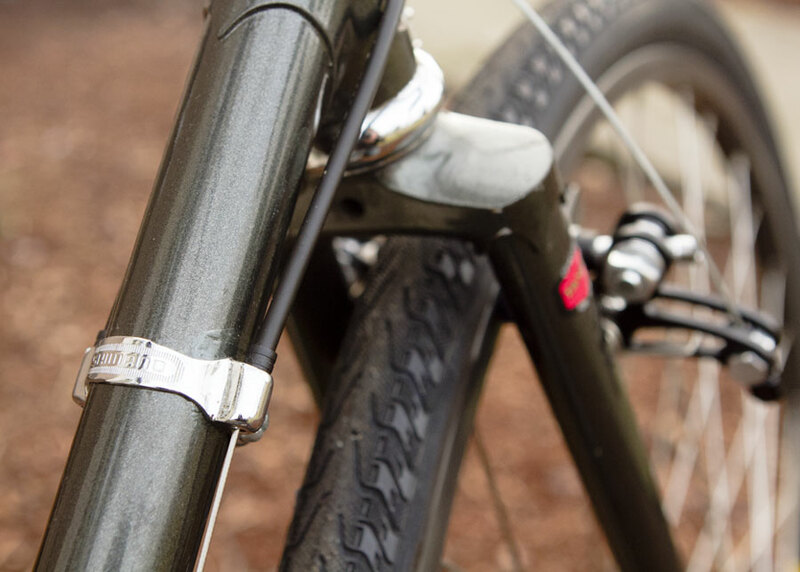 A lightweight, wide profile canti brake with wide clearance and powerful stopping abilities. Plus, they came without logos or badging and were muted enough to not draw too much attention. The gamble paid dividends and the brakes fit splendidly. Although an issue at the time, the solution of the Planet X Frogs should be noted for anyone who has a vintage touring or cyclocross frame. At the time of purchase, I looked over what would have likely been a deal breaker had I noticed it. At some point in time, a previous owner had somehow removed, ground down and smoothed off the shifter bosses. Sometimes people make this incredibly ridiculous alteration for rear dropout hangers to make homemade track bikes but I could see no reason for this particular modification. Luckily, they didn’t do a half bad job smoothing the blemish down, so I made sure the area had no rust then touched it up properly. A Shimano downtube shifter cable stop clamp band was installed and easily, and tastefully, takes care of the missing shifter bosses. 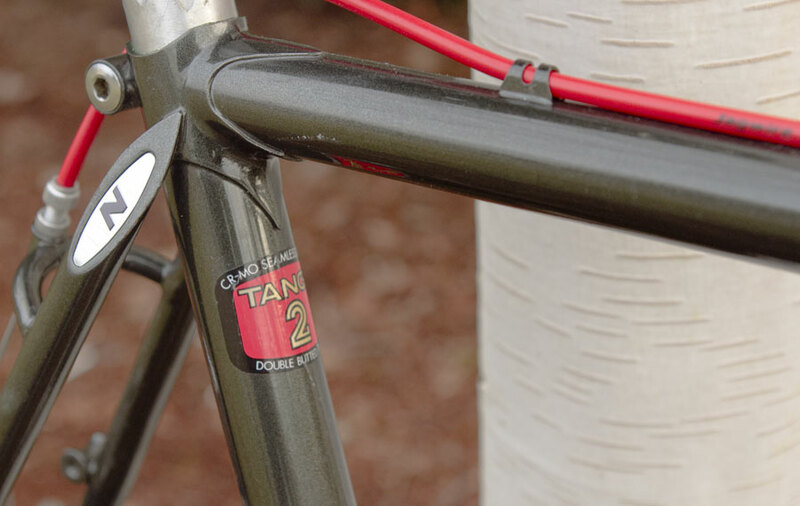 The Nishiki was originally stocked with two, dramatically ovalized Sugino Cycloid chainrings. These rings were built to compete with Shimano’s Biopace to smooth out the delivery of power to the rear wheel. But now, they both are more of an oddity than anything. Although this was a fine idea in concept, I have no tolerance for either the Sugino or Shimano chainrings of such a nature in this, or any, of my builds so off they came and new circular Sugino rings were popped on. 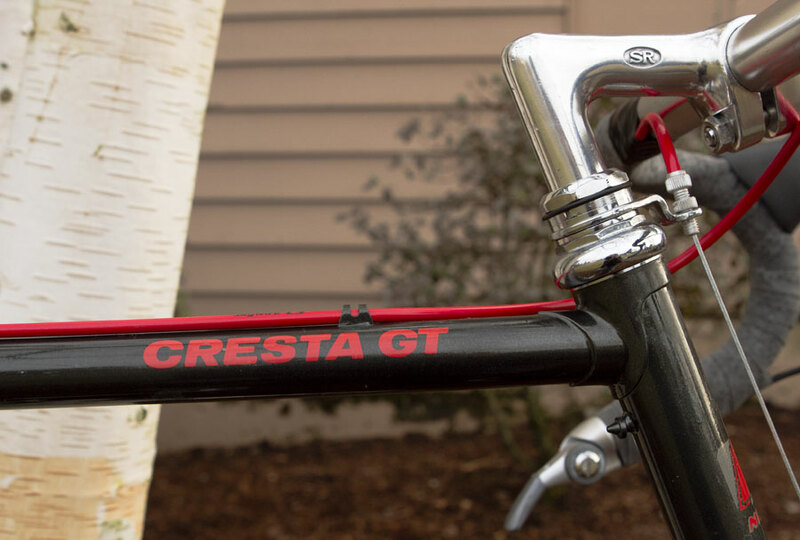 Originally the drivetrain was decked out in a full Suntour group set. 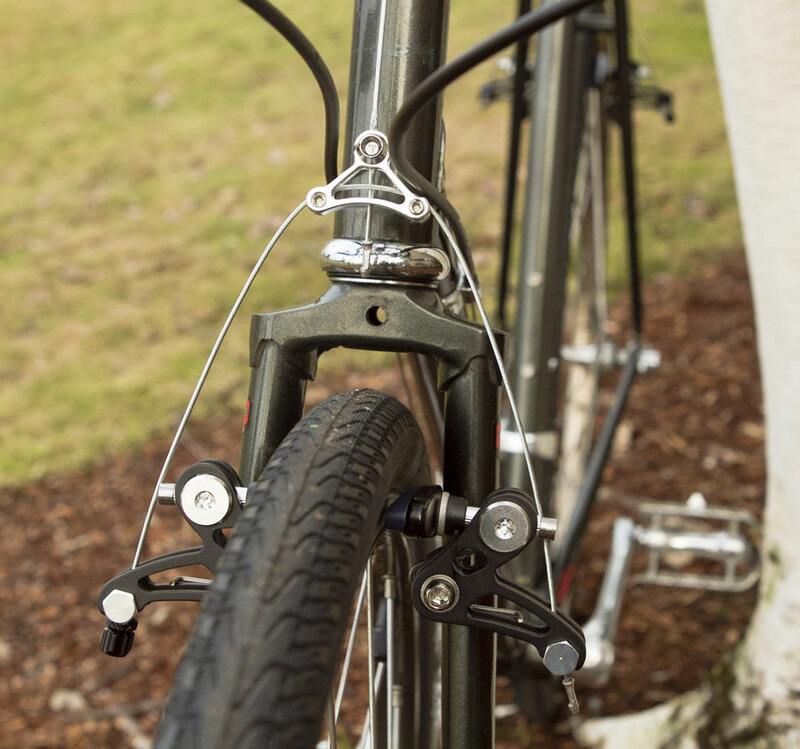 This would have included the intriguing and increasingly rare 3-pulley rear derailleur system Suntour developed initially as an Nishiki exclusive. 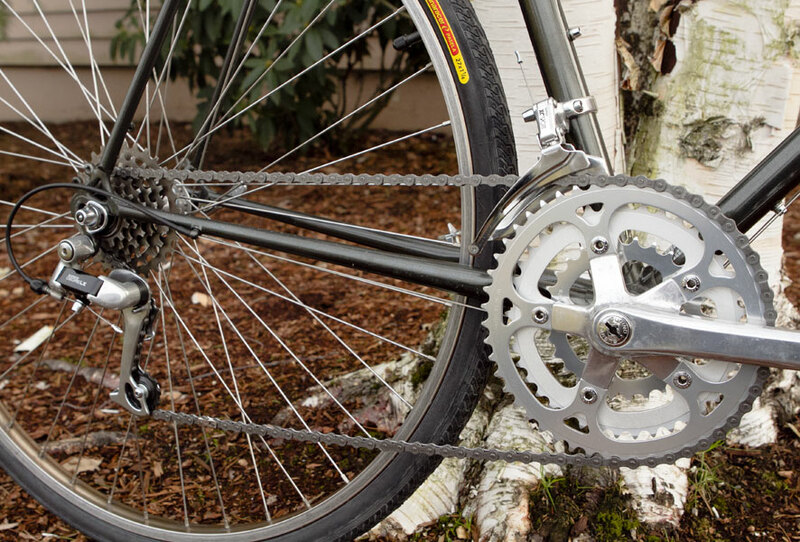 The extra pulley was said to handle chain slack by wrapping more than any other standard long cage derailleur. It is unfortunate this component was long gone by the time I obtained the bicycle. However, the long cage Shimano Deore LX, with its silver body and contrasting black panel that replaced it is certainly no slouch and not a bad alternative to have on your team. In the 80’s, Nishiki was pumping out excellent, undervalued bicycles. 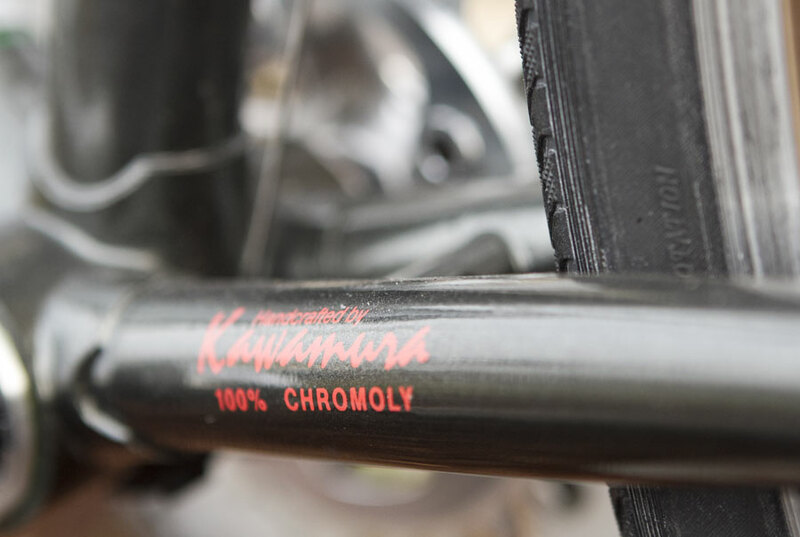 Although the manufacturing process slanted toward mass production, a number of frames were still handcrafted with subtle but impressive details that were found in much higher-end bicycles at the time. One such detail, highlighted below is the classy addition of the inset “N” embedded into the rear seat stay caps. Don’t let the seat stay caps hog all the attention. 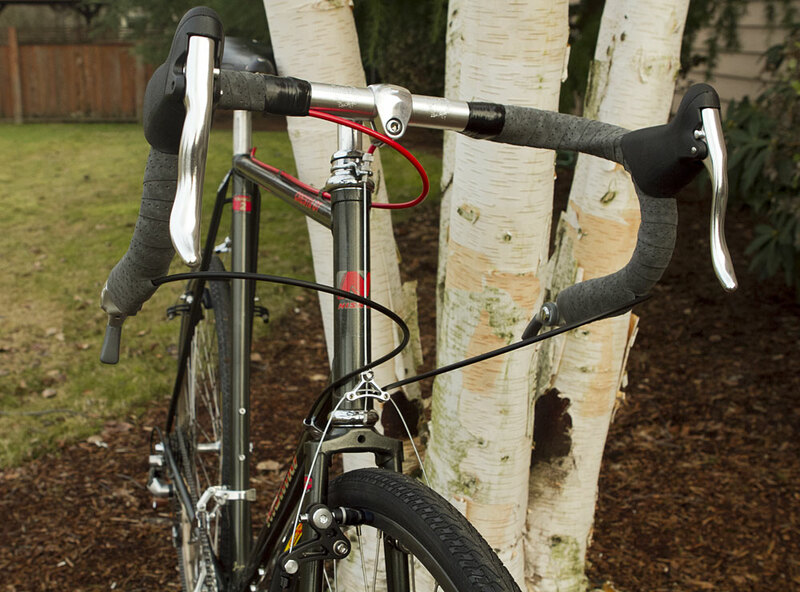 Make sure to take note of that edgy and gorgeously brazed seat stay cluster. Other notable elements to this bicycle are the incorporation of an outstanding 22 frame bosses! This includes room for three water bottles along with double eyelets front and back along with a few other bosses scattered around the rest of the frame and fork. Equipped with full gran touring geometry this frame was made with calculated Japanese craftsmanship and overall it was easily a steed worth taking time to preserve and get back on the road for another few decades of dedicated service. What a well thought out job! These touring bikes from the 80’s have special features and quality that cannot be rivaled for this relatively low price of entry. Wonderful! I appreciate each viewer who comes to visit the site and I am even more delighted when one takes time out of their day to post a comment. However, I have the utmost recognition and respect for my fellow colleagues who also spend hours, toiling away, scrubbing the tiniest bolt or moving through six different grades of sandpaper to get the shine just right as they restore their own projects. So I thank you, Nola, for the praise and comment. It is taken with the most sincere humility and gratefulness. I just put 100 miles on this bike and have enjoyed it. I rulelargy commute by bicycle to work (4.5 miles one way). So I have only had the bike a couple months. I like not having to worry about my pant leg getting greasy. Since I pedal to work for exercise and not for the sport of cycling, the fewer gears and other things that could be considered downsides to this bike haven’t been missed. It’s reliable, cleaner, and I expect will be easier to maintain through the years and last longer despite Tennessee rain. At work I don’t have an indoor place to park and it has already seen 1 or 2 rainstorms. After biking home on a wet day, I wipe it all down with a towel and don’t feel bad washing the towel with other things because it doesn’t get greasy. So far it’s been exactly what I hoped for. Now only time will tell if it will exceed my expectations in regards to maintenance and lifespan.\//Update 2012-12-14\//After 200+ miles the left crank arm started loosening. I now carry the necessary Allen wrench with me so that I can tighten it whenever I notice it. I fixed the problem for about 3 months of riding (~75 miles) by removing the bolt, cleaning it with a wire brush to remove the Threadlocker Blue that had been used during assembly, and then applying Permatex Threadlocker Red (super-strength, available at auto part stores). Today I called Dynacraft’s customer service and they were fantastic! After giving them the model #, production date, and serial # (which are found on the bike), they readily agreed to send me a new bolt and new crank arm. Hopefully, this will solve the problem. I suspect that the current crank arm got deformed a bit making it more prone to loosening even though it feels solid when tightened. I had wondered if reverse-threading that bolt that holds the crank arm onto the bottom bracket would solve the problem, but it seems that right-hand threading (regular threading) on the left side is the norm (see Precision (mechanical) or Bottom Bracket on wikipedia). In any case, today’s reapplication of Threadlocker to the bolt should hold it until the new parts arrive, but I’ll be carrying the Allen wrench when I go biking just in case. Wow Jared, that is a heck of an update! I am pleased to hear that your Cresta is treating you well and you are bonding with it during this small maintenance period. Treat it right and it will carry you for decades! Thanks for sharing your experience. You are too kind, Pete. Thank you for the accolades. I spent quite a bit of time making sure this rig was just right for my pal. He’s a good guy and there is nothing more I want to see then everyone I know riding vintage bicycles. Although, I would settle for having all of my friends simply riding bicycles on a regular basis. My buddy who received this bicycle certainly does. Who knows. Maybe we’ll even hear from him on how he likes it. The projects keep coming! Some I report on, some are small and/or quick so I leave them off the site. Keep an eye on the site. I’ve got posts waiting in the wings. As for your Semi-Pro, I am thrilled to hear it is still the bike you had hoped for! I continue to keep an eye out for you on the Pro-Tour but they are becoming as rare as hens teeth. Enjoy the upcoming riding season! I also ride an 86 cresta GT and am lucky enough to have found the bike with the 3 pulley derailleur and shifting bosses still attached and functioning. I ride mine ~6 miles everyday for commuting and have done so for about 2 years. Thanks so much for the info contained on this page!. my left crank arm has also come slightly loose so it sounds like a possible design flaw but good to hear about options. As for your crank arm, perhaps the bottom bracket just needs tightened? A story unfolds once you begin removing parts. Start by using a crank puller to pop the arm off, then check the bottom bracket. Is there any play? How does it spin? If there is any wiggle or odd issues, it may need adjusted. And since a fair distance on a daily basis, perhaps the bottom bracket could also use an overhaul (or replaced with a cartridge style BB so you don’t have to think about it for a few thousand miles)? If you aren’t mechanically inclined, any local bicycle shop can perform this routine maintenance for a very low cost and quick turn. Another superb bike! I may be wrong but isn’t the Deore LX RD indexed? Are the bar end shifters indexed as well? Would that be do-able as a nice invisible upgrade? You know, John, I don’t believe I even put that one together. Even the freewheel matches. Next time I get together with my buddy, I’ll play around with the settings. I have an 86 Cannondale ST400 (significantly re-designed) that has a “too modern” Deore RD. When i saw your Nishiki it struck me. I dug up a road rashed DeoreXT RD M735, removed the graphics and polished it up. I need a different freewheel to replace the Megarange (goofy looking and too large). The bike will be more age synched. I tried to use a set of Tektro CR720’s on a 1986 Schwinn Passage, probably built by Panasonic, and the rear worked fine but the front had the same issues you did. Fortunately I still had the original Dia- Compes for the front. I am using a newish (2010?) Deore LX MD 581 RD which seems to work so far. The Planet X Frogs Bollox canti’s are still available for purchase. To this day, they are the only modern cantilever caliper I’ve found that will work. But, the Dia-Compe’s should also work just fine so long as they are in good shape (with new pads). Thanks Josh, good to know the Planet X are still an option although I have sunk a fair bit in new parts into the Passage so far so I will at least start with the Dia – Compe 960s up front. My working on the Passage is all your fault by the way, I got the mid 80s touring bike bug from reading about all your cool projects including this Nishiki. I’m certainly in favor of the “easiest and cheapest” method first and the Dia-Compe 960’s are nothing to scoff at. I would have used them on my build but both sets that came with the frame had parts missing and were in generally poor shape. I look forward to hearing and seeing how your Schwinn shapes up! So far, it sounds like a glorious build! The 80s era of touring frame was a golden age for our kind. Hi Josh, I like the fact that you do projects on vintage steel bikes. 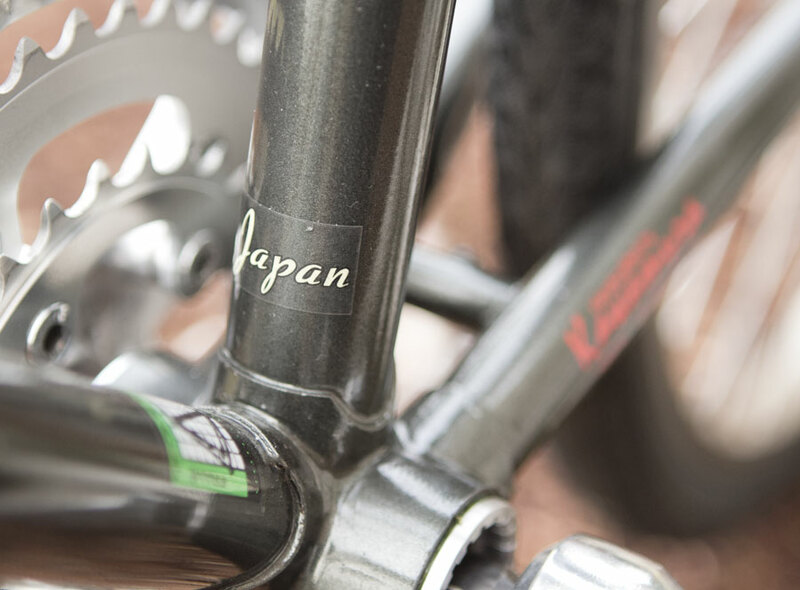 I grew upon steel Japanese bicycles so maybe I’m biased, but I find they’re the best riding of all the materials available. from gaining ground on them. Perhaps they could have done a little more research and gotten a home run like the Mountech front, which is an outstanding mech. Overall, SunTour still made the best and longest lasting non-indexed derailleurs, shifters, and freewheels for the money imho. I replaced that Mountech with a Shimano STX I had laying around using it with SunTour power ratchet downtube friction shifters. 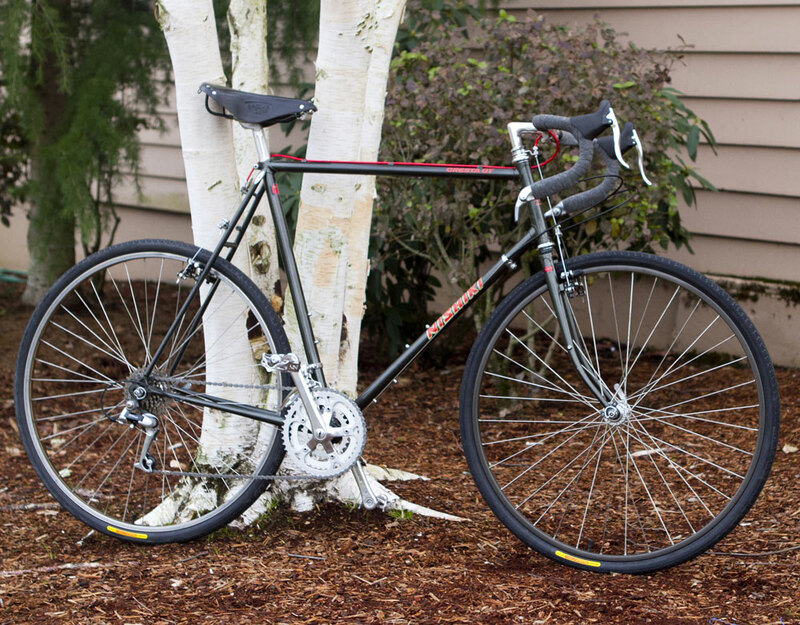 I also have an ’81 62cm Nishiki International, an ’83 66cm, ’84 60cm Specialized Expeditions, and an ’81 62cm Miyata 610. Keep up the good work, Cheers ! The component tweaking will always be but as for frames, you sure don’t have any slouches in your stable! All solid, well-rounded picks. Thanks for sharing your fleet and thoughts on the Mountech. I haven’t gone down that path before but it’s good to know the harsh reality (front derailleur = great! Rear derailleur = bad!) from someone who has gear tested them. This entry was posted on February 10, 2014 by Josh C. in Cycling Projects, Topics and tagged Dia-Compe X1, Gran Touring Geometry, Hadcrafted by Kawamura, Planet X Frogs Bollox Cantilever, Sugino Cycloid, Suntour 3 pulley system, Tektro CR-720, TEKTRO R200.